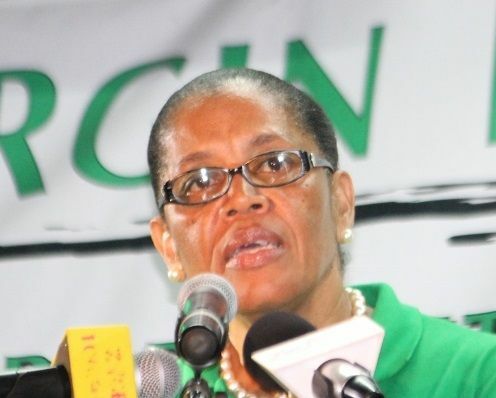 She was speaking as one of the preliminary speakers at the VIP meeting in Capoon’s Bay on June 3, 2015 which featured First District Representative, the ‘Bronx Bomber’ as he is also known, Honourable Andrew A. Fahie. Penn-O’Neal said there will be population policy research and specialists will be hired to carry out such research regarding the evolution of the territory’s population and with the aim of better population management. She said too that the VIP in Government will establish a population education programme with the schools and the people of the territory. According to the At Large candidate, immigration and labour policies will be organised around the new population policies. Despite these statements, she slapped down the suggestion that these proposed policies spell trouble for migrant workers. She urged them not to fall prey to the National Democratic Party’s scare tactics of telling people that should the VIP win they will be sent home. She said that there is nothing further from the truth. It has been established that Virgin Islanders are already outnumbered in their own country and this has raised concerns regarding jobs for locals and the ability of the territory to be able to provide essential services in the face of an ever expanding population. All politicians say this and that about immigration and labour reform and when they do get into power/office is either they forget the issue or make it hard or detrimental for all nationals or non nationals. Not only research but a "UNIT" which means staff and equipment which comes with money. Also, there will be an educational "programme" which means changing curriculum and possible training teachers on it. All spell more money. This on top of a promised 8 % increase to civil servants. Tax cuts, and Maynard promising child care subsidy. All of which costs money. I hope they truly take it seriously because time is running out....'time is not your friend when dealing with these matters'. As she said the population is growing and your kids can be bombed out of their career choices in the very near future. DON'T SPLIT YOUR VOTE. Vote VIP ALL THE. There is much danger in splitting votes. All that glitters is not gold with the one you named. Too much power has already gone to his head. @ Vision .... need him to do what? what does this actually mean? The policy is that if VIP are elected VIP will prepare a policy on this subject? As someone who is reduced to mere observer status, there seems to be very little in the way of actually thought out policies in this election, other than from Dancia Penn who seems to have some actual proposals. Enforce the dam immigration laws. All I know is I waiting on the promise NDP made in regards to paying tax once you reach 15,000.